Taking a leaf from YouTube trends, such as eating shows, major South Korean brokerage firms are using the video sharing platform to increase online interaction with investors and inject creativity into market reports. Kiwoom Securities, an online brokerage services provider, has been a front-runner in the trend for years, with 22,193 subscribers to its YouTube channel as of Tuesday. The channel, launched in 2013, has the most subscribers among local brokerage firms. Most of the uploaded content are stock reports that take the form of videos starring analysts -- the basic format of videos uploaded by a majority of brokerage firms here -- but the firm has also included elements of eating shows, or “meokbang,” to distinguish itself. In a November 2018 video explaining a surge in the share price of Ottogi, one of the nation’s leading ramen manufacturers, anchors ate the firm’s Beef Miyeokguk Ramen, which was just introduced to the market at the time. The scene livened up anchors’ comments on whether Ottogi’s new instant noodle line would affect its stock price. 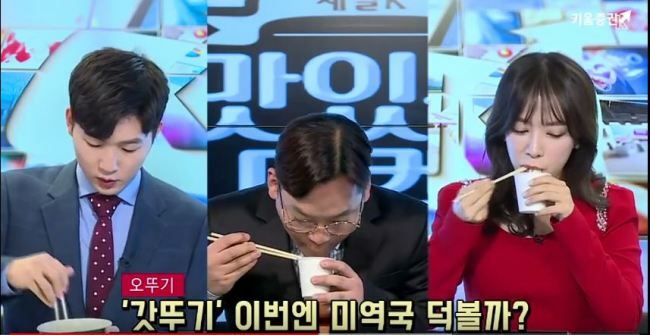 Anchors also drank beer produced by Korean liquor maker Hite Jinro in a blind taste test with foreign rivals, in a video released the same month. They projected the firm’s stock price while carrying out the test. “It is easier to interpret the trends and flows of the stock market if investors understand macroeconomics,” Hong told The Korea Herald. “Reports written in words carry much more short-sighted information compared to videos,” he added. Hong’s personal channel, which has more than 10,000 subscribers, decodes the latest trends in the market based on global news and data from key organizations and institutions, such as the Organization for Economic Cooperation and Development and the Bank of Korea. The analyst, who also runs a blog on the nation’s top internet portal Naver, noted the differences in sharing the same in-depth content via text and videos. “When I share my analysis through my blog, I receive negative feedback linked to poor understanding of my content. But with YouTube videos, I get more productive comments with the same content,” Hong said, highlighting his belief that viewers grasp content shared via videos more clearly. Meanwhile, Hana Financial Investment has added a twist to market reports by livestreaming a group of its analysts having their daily morning meetings. They offer analysis on some of their top stock picks while answering questions that investors have at that moment. “The viewership is steadily rising,” a Hana spokesperson said. Besides market analysis, brokerage houses promote financial products via advertisements on YouTube. Samsung Securities has been actively uploading content to its channel in recent months to promote its mobile and online account system. Videos containing step-by-step instructions for its mobile system were uploaded, alongside a quirky commercial featuring Korean actress Yoo In-na. The commercial has gained more than 8 million views in three weeks. KB Securities also uploaded a promotional video for its Global One Market Service, which targets investors in their 20s and 30s with interest in foreign stocks. With major brokerage firms downsizing their brick-and-mortar branches, amid a surge in mobile service users, YouTube is increasingly playing a role in promoting financial products and services. According to the Korea Financial Investment Association, the number of brick-and-mortar branches of 55 securities firms with at least one business unit here came to 979 at the end of last year. This is 46 branches less than the previous year. But the new approach does not always come easy. Most videos uploaded by brokerage firms struggle to attract views, hovering under 1,000 or even 100 views. At the moment, only commercials starring famous celebrities have reached more than 1 million views. “We are currently looking for ways to attract more viewers for our original content, but it’s a relatively new trend, so we’re still struggling to create the right videos,” a spokesperson at a local brokerage firm said.